These monster moths might flutter around lights and charge headlong into candle flames – even worse – your gin and tonic. But if you look closely, they are dazzling creatures really. There have been more than 2,500 species of moth recorded in Great Britain, and many come with names as strange as themselves. Monster moths are kind creatures and often misunderstood. Many people think of moths as rather boring little brown jobs that can be a nuisance when you sit out on a warm summer’s evening as they flutter around lights and charge headlong into candle flames or – even worse – your gin and tonic. At best they are there to provide food for bats and at worst our clothes are there to provide food for them. Watch our short clip on the Hawkmoth and admire their exotic wings. These misunderstood monster moths hate daylight and will quite happily spend months concealed in dark wardrobes where they can breed in peace. If these fumbled creatures have made their way into your home is time to reach for the moth repellent and save your luxury linen and repair your moth eaten Musto. When the moths have vanished, find out how to get rid of the smell of moth balls. I want to present another side to monster moths. I have been fascinated by them since I was about six, when I found a large, hairy caterpillar (which I knew was called a “Woolly Bear”) wandering across the lane by my home. I gathered it up and put it in a jar with ventilation holes in the lid. It soon turned itself into a brown, rather nondescript chrysalis. Every morning I would jump out of bed to inspect the contents of the jar, only to be disappointed. Then, one day, after what seemed like a lifetime of waiting, I peered into the jar to see the most exquisite creature I had ever laid eyes on. It looked enormous to me, with its pristine forewings covered with dark-brown spots and blotches on a white background. I took the lid off the jar and tried to prise the creature out but, as soon as it realised that I was there, it opened its wings up to reveal bright-orange hindwings covered in blue-black spots. This sudden revelation worked as intended and I jumped back with surprise and, from that moment on, I have been hooked on monster moths. That moth was a Garden Tiger and it was the thought of woolly bears turning into tigers that encouraged me to start learning more about the other extraordinary names that have been given to moths: Carpets, Daggers, Darts, Footmen, Kittens, Pugs, Quakers, Elephants, Tigers and Leopards, each referring to some family characteristic, such as the elaborate patterning of the Carpets or the rather plain appearance of the Quakers. There have been more than 2,500 moth species recorded in Great Britain, of which around 900 are so-called larger moths (macro-moths) and 1,600 micro-moths. This makes the number of butterfly species – 60 – seem tame in comparison. Let’s start with the big guys, the hawkmoth tribe. The Latin name for the hawkmoth family is Sphingidae and this refers to the sphinx-like attitude that some of the caterpillars adopt when frightened or alarmed – the head and thorax rear up. Some even have coloured “eyes” to ward off predators. Elephant Hawkmoths are so called because of the extraordinary way the caterpillar’s thorax and “eyes” swell to resemble, yes, an elephant. Also, once you have seen an Ele-phant Hawkmoth adult, you will never call monster moths boring little brown jobs again. With its pink-and-olive-green forewings and pink-and-black hindwings, the Elephant Hawk-moth is such an exquisite insect that you might well imagine that it comes from an equatorial rainforest rather than the UK. August is a good time to spot the caterpillar of the fuchsia and olive-coloured Elephant hawkmoth. The migrant, day-flying Hummingbird Hawkmoth is well named as it looks just like a little hummingbird, darting from plant to plant where it then hovers, feeding on the nectar. I grow red valerian to attract this busy little imitation of a hummingbird as the nectar is a particular favourite. Others are jasmine, lobelia, petunia, honeysuckle and buddleia. When I see this wonderful monster moth, I feel up-lifted to think that it has travelled from the Mediterranean region to feed in my garden, so I was interested to find that many Europeans (especially the Italians and Maltese) believe it to be a bringer of good tidings. There is a lovely story of a “swarm” of these moths being spotted flying over the Channel, heading towards England from France on D-Day 1944, and all those who saw them returned safely to tell the tale. However, the “king” of British hawkmoths must be the Death’s Head Hawkmoth – so called because of the skull-and-crossbones markings on its thorax. Our largest hawkmoth, it makes a squeaking sound when disturbed and has been known to visit wild bee nests to feed on the honey, the same squeaking noise apparently calming the bees. The food plant of this species is, rather bizarrely, potato leaves. Leaving the hawkmoth family, let’s take a look at some other monster moths with interesting names, such as the Mother Shipton. Study the wings of this moth and you can readily discern the image of a rather hideous old woman. Old Mother Shipton, a 16th- century Yorkshire witch, was the most fa-mous prophetess of the British Isles and a particularly ugly figure. By all accounts, her nose was a sight to be seen. Take another glance at the outline on the wings and you can see why this moth is perfectly named. For some monster moths you need to delve a little more deeply to find the meaning behind the name, which can be quite entertaining. Take, for instance, the scientific name of the Dark Crimson Underwing, Catocala sponsa, which refers to its bright-red hindwings, usually hidden when at rest. Translated, it means “below”, “beautiful” and “bride”, apparently referring to an old tradition of brides wearing gaudy underwear. The underwing family also contains a monster moth that was heavily sought after by Victorian collectors. Known as the Clifden Nonpareil and also often called the Blue Underwing, it was first discovered in the village of Clifden, Buckinghamshire (now Cliveden), while the Nonpareil part of the name comes from the French for “without equal”. Blue is not a colour normally associated with moths, apart from a fleck here and there, however this big beauty has glorious lilac-blue underwings, making it unique among British moths. It had become extinct in the UK as a breeding moth, only very occasionally turning up as a scarce immigrant. However, it appears once again to be establishing itself along the south coast, with particularly good catches occurring last summer. a decorative “wing flap”. Could this be the gentleman of the moth variety? Some monster moths are masters of disguise and have evolved to look like something else completely. Take the Lunar Hornet moth, which, indeed, looks just like a hornet, even down to its transparent wings. It flies around in the knowledge that predators are highly unlikely to attack it, which is pretty clever stuff. The wonderfully named Setaceous Hebrew Character monster moth is so called because it is rather bristly with a black mark on its wings that exactly resembles the Hebrew letter “nun”, which looks rather like a backwards “C”– so it really is what it says on the label. The Chinese Character monster moth, so called because the subtle marking on its wings roughly resemble the form of a faint Chinese symbol, has taken on the exact appearance, in colour, shape and size, of a bird dropping, making it look like a less-than-tasty meal to any passing bird. Moths belonging to the family Saturniidae are often known as Emperor moths because of their size and handsome colours, and these spectacular-looking insects have an impressive sense of smell. Female Emperors produce pheromones to attract males, while the males use their large, “feathered” antennae to pick up this scent as it wafts on the air and can trace a female from a distance of up to five miles. The Peppered monster moth was actually not particularly “peppered” once upon a time but looked quite pale with, perhaps, just “one turn of the pepper pot” giving it a faintly speckled appearance. However, when the Industrial Revolution got underway, with its associated sooty grime, it darkened the background colour of many tree trunks. As a result, these light moths, which had once been camouflaged against the pale birch trees, were now easily spotted and eaten by birds. 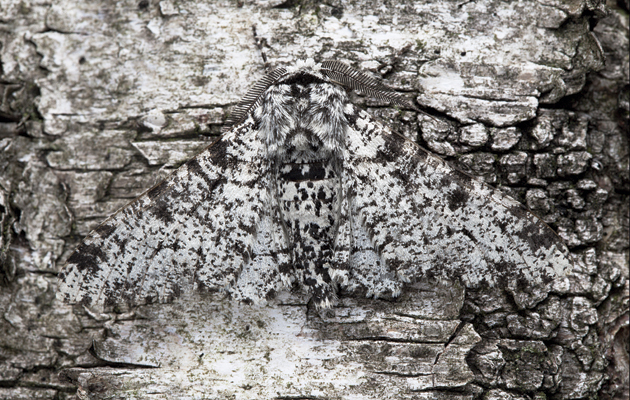 This meant that the rarer, darker variety of the Peppered moth, with the equivalent of a dozen turns of the pepper pot, was now well camouflaged, which gave it a distinct advantage. As a result, this variety became far more numerous in urban areas than its pale cousin – evolution on fast forward. Can you spy the Peppered moth camouflaged against the bark of a birch tree? is quite like the semi-precious gemstone and the Wainscots resemble the texture of the oak panelling that could be found in a Georgian drawing-room. 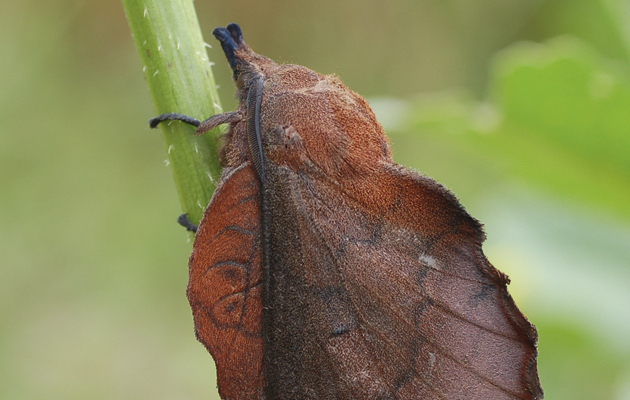 The rather strange-looking Lappet moth acquired its name due to the “wing flap” that protrudes from under its main wing, just like the decorative fold in a ceremonial garment. Then there are those monster moths that really have to be given a certain name because, as soon as you see them, it is just the obvious choice. Take the Spectacle moth, for instance. If you get down to its level and peer into its face, you quickly spot that it is indeed wearing glasses. The Peach Blossom moth has, yes, you have guessed it, peach blossom scattered across its wings and my favourite of all, the exquisitely named Maiden’s Blush, is a delicate, feminine little beauty if ever there were one. Finally, an admission: there are some moths that can, indeed, justifiably be des-cribed as boring little brown jobs, having few distinguishing features to help identify them. This led one entomologist, struggling to choose a name for his nondescript find, to plump for “The Confused”.